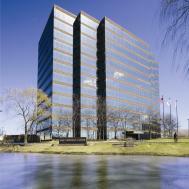 1600 Corporate Center is a 255,440 square foot 12-story, Class A office building located in Rolling Meadows, within Chicago's Northwest Suburban submarket. It offers tenants 20,900 rsf floor plates and its column-free design caters to large and small tenants alike. In addition, the building offers 12 corner offices per floor. With its upgraded HVAC and abundant riser space, the building is fully sprinklered and equipped with a comprehensive fire life safety system that includes an advanced smoke evacuation system. Situated on a landscaped campus with unencumbered views of the Ned Brown Forest Preserve, building features and amenities include marble finishes, conference facilities with multiple fiber providers, deli, ATM, vending room, manned security, loading dock and outdoor patio. The building also features on-site property management and a 24-hour keycard access.